/ How to Break in Hiking Boots without Ruining your Feet! Hikings boots will probably be a big investment. But it's also one of the most used, all-around items that will make or break your hiking experience. Hiking boots are also looking sleeker and more stylish, and a type of footwear that you might end up using in your day to day activities. But finding and investing in a good pair of hiking boots will only be the start. Making sure that they are comfortable and up to anything you throw at them will be the hard part. So here we check out how to break in hiking boots, to make sure you're comfortable with your investment and your feet! Hiking boots are unlike your traditional footwear. Generally, you might want your footwear to be lighter so there's less effort in walking with them. But hiking boots are designed to be heavier and more durable. This is so the boots are more sturdy and heavy-duty. They will last in conditions where it is wet and protect your feet from rocky terrain. 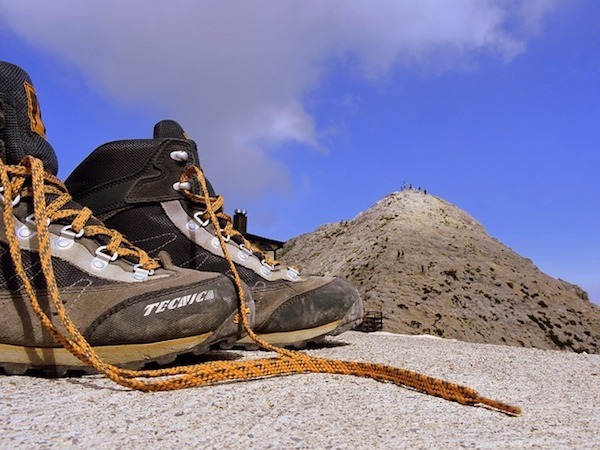 Most hiking boots are designed for your typical activities such as walking long-distance, hiking, trekking, backpacking, climbing, hunting or mountaineering. Hiking boots are designed to provide warmth, and cushion the feet in extreme activities. They should also be well-ventilated to stop bacteria from forming, to avoid those dreaded stinky feet! The boots will also have ankle and foot support for hiking in terrains where the ground might be uneven. Because of the support and the stiffer material, this can mean hiking boots take longer to get used to. Upper - this is the top part of your boot. It is important in protecting and supporting your foot. Ideally this should be water repellent or waterproof but still allow the airflow. Outer sole - the sole of a hiking boot is very important as it will provide friction and stop you from falling or slipping over. It will also absorb shocks and should be tough enough to stop sharp items from penetrating your boot. Tongue - this the flap that covers top of the upper, just beneath the laces. Tongues will stop dirt, debris, sand, and sometimes water, from entering the boot. Linings and Paddings - the nice soft bits that help cushion your feet. Insoles - will support and balance your feet. Over time this will shape perfectly to your feet with personal grooves. Scree collar - this is the cushioned part at the top of your boot. It is designed so that it protects against chafing your Achilles tendon and ankle. When pulled tight it will also stop small rocks from entering your boot. Why do you Need to Break in Hiking Boots? 'Breaking your boots in' allows your feet and the brand new boots to figure each other out. When the boots come out of the box, they were created according to generic specifications. eg. A typical size 11 foot. But everyone's foot/feet are different and people push down on a certain part of their foot different. You need to let the boots get used to your feet and make its own personal grooves. Have you ever tried someone else's flip-flops on? They feel so wrong! Your hiking boots are made of sturdier and stiffer material. If you don't allow your foot to mold to your foot properly, this will cause problems. This will cause friction which turns into blisters if certain parts of the boots are constantly rubbing against the skin of your foot. 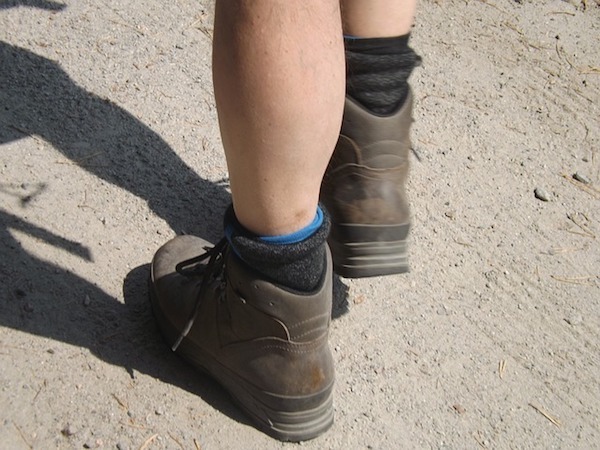 If you break in your hiking boots properly, you can help prevent blisters and sore feet. Such problems will definitely slow you down on those hikes! But even worse, they can cause long-standing (see what I did there?) problems with your tendons in the muscles in your feet and calves. How to Break in Hiking Boots? STEP 1. Wear the boots around the house for a few days. Make sure you combine it with the socks or arch support that you would normally wear on a hike. Lace up the boots properly, but not too tight or loose. During this time, take note of any potential irritations or painful bits. This is normal. Give your feet a chance to get to know the boots. You can use a rubbing bar or another object to rub against the sore parts of the boot. This will wear it down slightly and soften the area. STEP 2. Step outside, and go out for a short walk. No more than 15 minutes. Take the boots out around the block. Again, be aware of any additional irritation between your foot and the boot. You can soften the boot by rocking back and forth on the balls of your feet. This will help create creases on the upper and the soles, which will help conform to your feet. STEP 3. 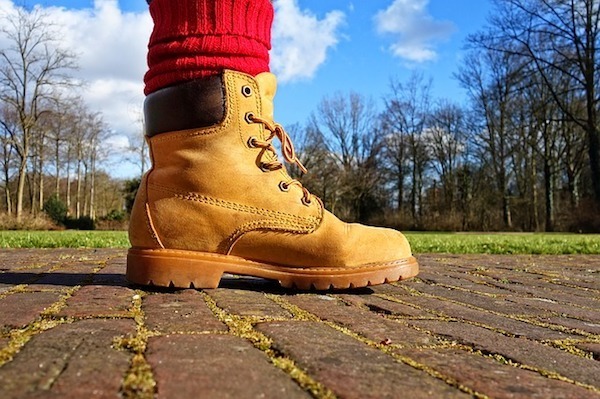 Increase the time you spend outdoors with your new boots. Each day by another 10 minutes. Make sure you don't limit yourself to just flat pavements. Start walking in the park, on the grass, up and down hills, and even on sand. Slowly, your boots will start to conform to your feet. Not the other way around! Extra tips to help you go the extra mile! You can keep your boots in a warm area to soften the leather and material. This will make it more malleable. When breaking in your boots, try carrying around your weighted backpack. This way the boots can get used to more weight being put on it. Use a hairdryer to soften certain areas while wearing the boot. If you are getting blisters on the back of your feet, it is probably because your foot is going up and down. Try wearing thicker socks, or adding an extra insole. Hopefully you know now how to break in hiking boots. Remember to give it time and not force the boots to break in. It won't work. You need to give it time to nurture the relationship between your feet and your boots. Allowing the boot to form and take shape, to the point where it will be like a 2nd pair of socks. Hiking boots are great companions and can be your most trusty friend for years to come, as long as you break your hiking boots properly! Let us know below if you have any additional tips for breaking in your handy hiking boots!